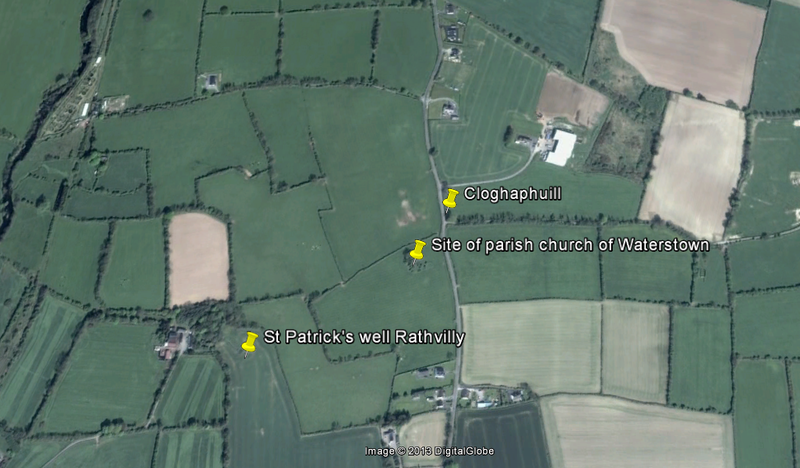 The parish of Rathvilly ( Ráith Bilech ‘fort of the old tree’) in Co Carlow has two really interesting pilgrimage sites, still venerated by local people; St Patrick’s well in Rathvilly townland and Clogh-a-phuill (the stone with a hole), a roadside shrine, in neighbouring townland of Ladystown. 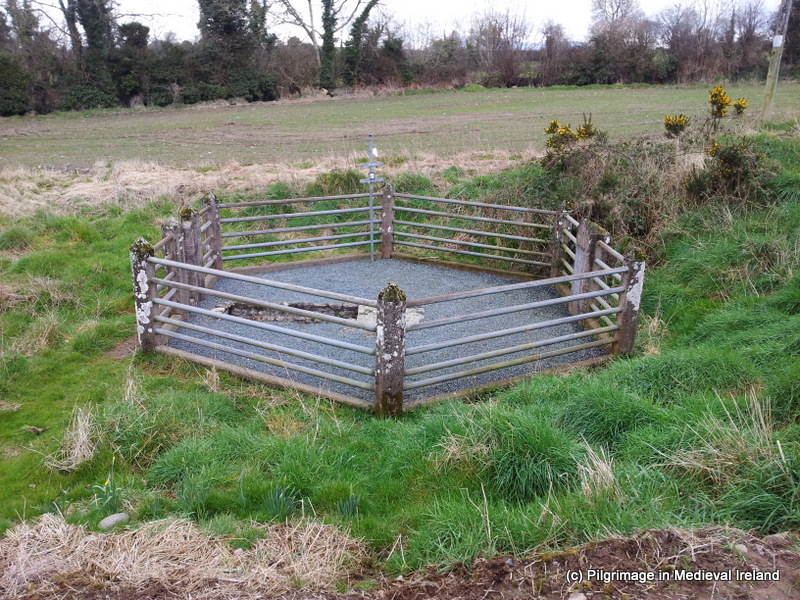 St Patrick’s well is located on private land in the townland of Patrickswell (Tobar Phádraig) at the bottom of a long sloping field. 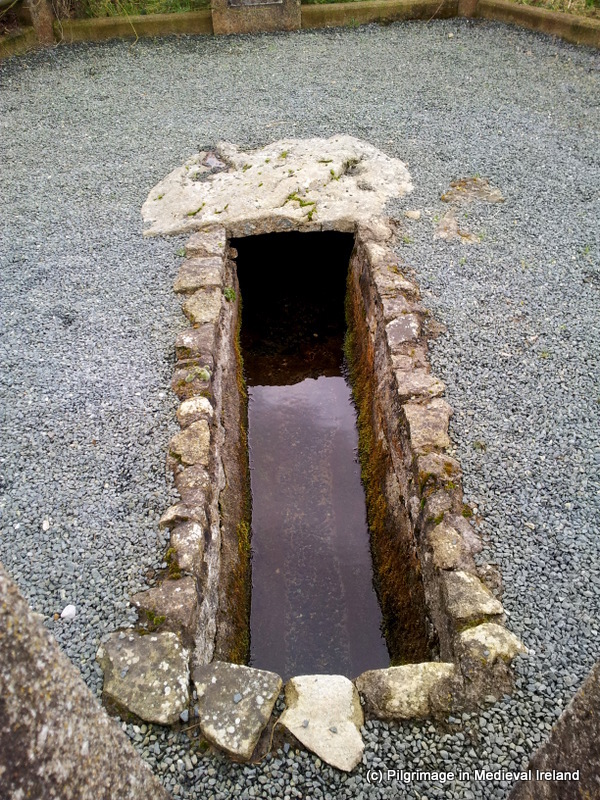 According to tradition St Patrick baptised Crimthann the King of Leinster along with his wife and child at this spot. The well itself is a natural spring capped by a large flat slab. The water follows away from the well through a stone lined channel. The area surrounding the well was enclosed in 1953 with a hexagonal fence. More recently the ground surface surrounding the well was covered in gravel. 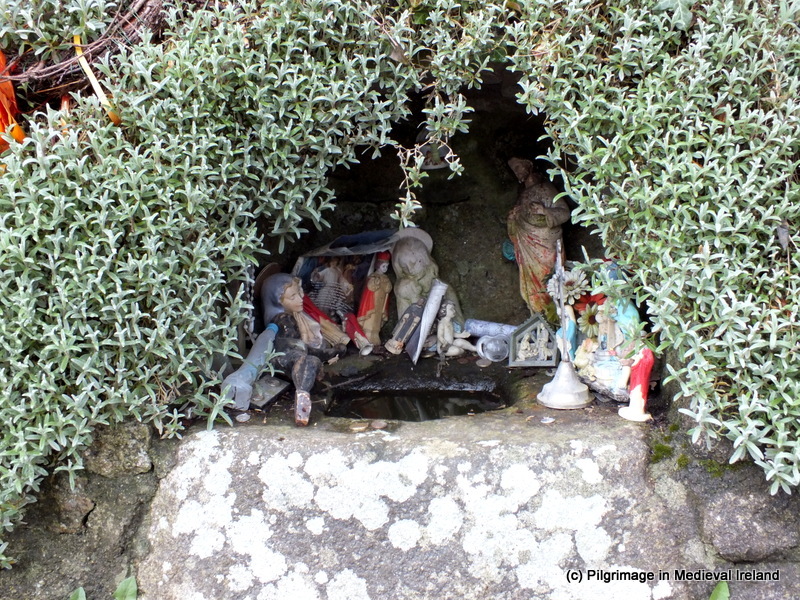 I didn’t see any drinking cups or votive offerings at the site but there were some coins in the waters of the well. The wells water is renowned as a cure for warts. People still visit the well especially around St Patrick’s day. I am currently looking into the medieval and post-medieval pilgrimage at the site so I will keep you posted on what I find out. 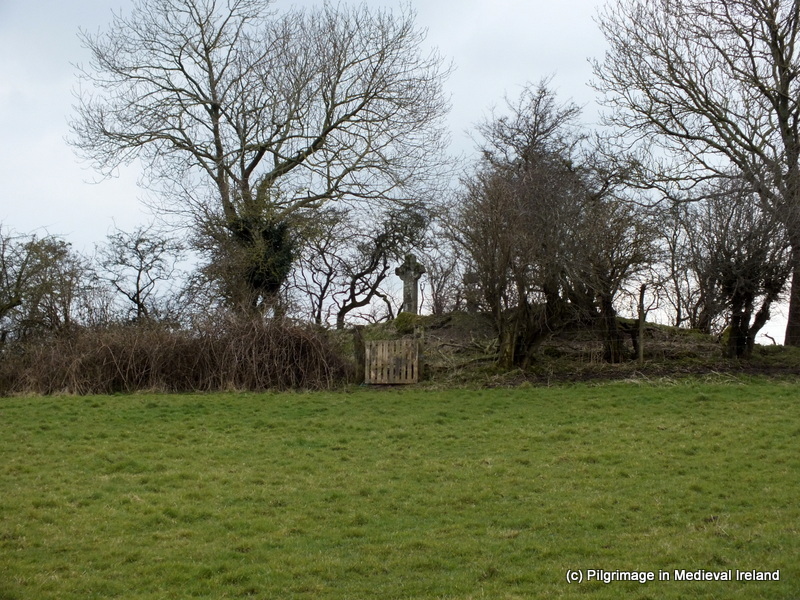 A short distance from St Patrick’s well is the ruins of a medieval church at Waterstown. On the 1st edition ordnance survey map of Co Carlow 1840 the site is recorded as church, graveyard and cross. The map shows the church as a rectangular building within a rectangular enclosure. The Ordnance Survey 25 inch map for the area recorded in the early 1900’s, shows the site as sub-oval mound with a cross at the summit. 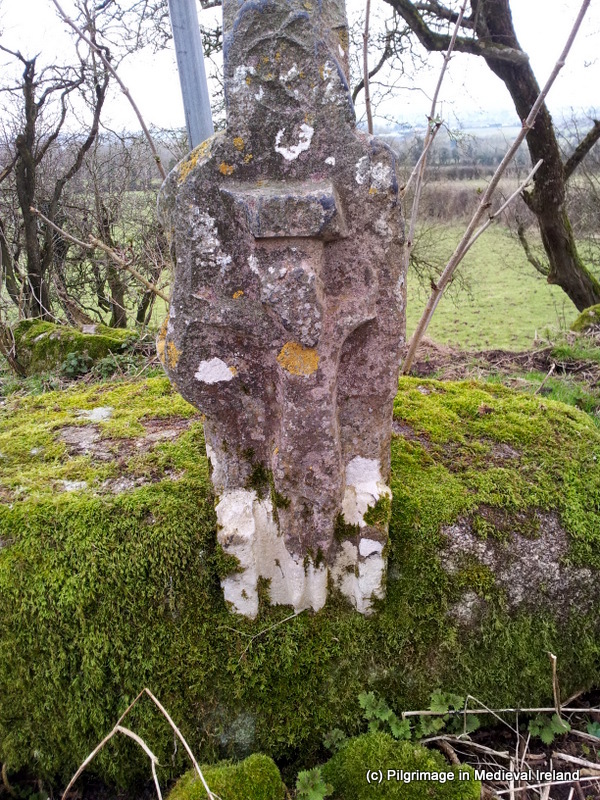 is a rude stone cross, embedded in a socket of like material and about seven feet in height. It is supposed that the parish church formerly stood at this place. Today the site is a mound covered in thick vegetation with two crosses on the summit. On the southeast side of this mound are traces of walls of a structure (most likely the church). On the summit of the mound are two medieval crosses. The larger of the two, is a high cross made of granite, it is undecorated cross with a solid wheel and edge moulding and sits in a large rectangular cut stone. The second smaller cross is made of limestone. It has a solid wheel but the arms of the cross have been damaged and it is decorated on both sides. The front face depicts the crucifixion of Christ and back has an abstract design. The cross sits in a large earth-fast boulder. These two crosses may suggest that this was more then just a parish church in the early medieval. 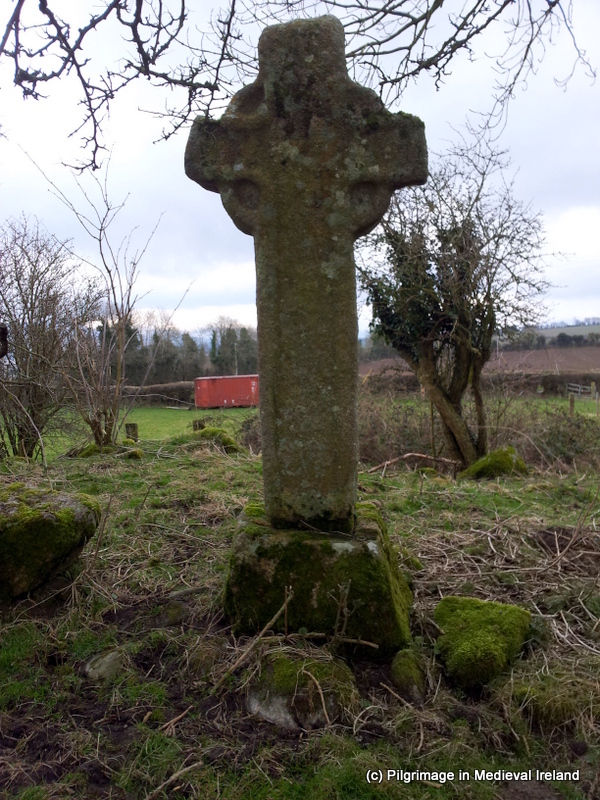 I have not come across any reference to pilgrimage taking place here at Waterstown or a dedication to a saint but given the areas connection with St Patrick perhaps we can speculate the site was associated this saint. 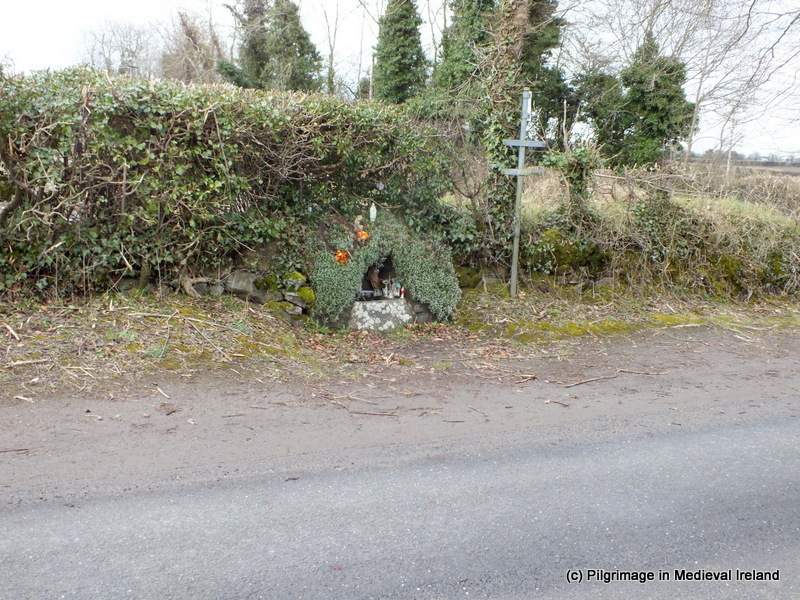 A short distance away in the townland of Ladystown at the side of the Rathvilly-Balintglass road is the shrine called Clogh-a-phuill (stone with the hole). The shrine is the base of a cross that most likely came from the nearby church site at Waterstown. It may even have supported smaller decorated cross mentioned above. The shrine is still visited by people and while I was at the site a man came along and stopped his car, got out and said some prayers here before heading away . There is an array of votive offerings holy statues, rosary beads and coins left here by pilgrims. Ryan, J. 1838. The History and Antiquities of the County of Carlow. Dublin: Richard Moore. 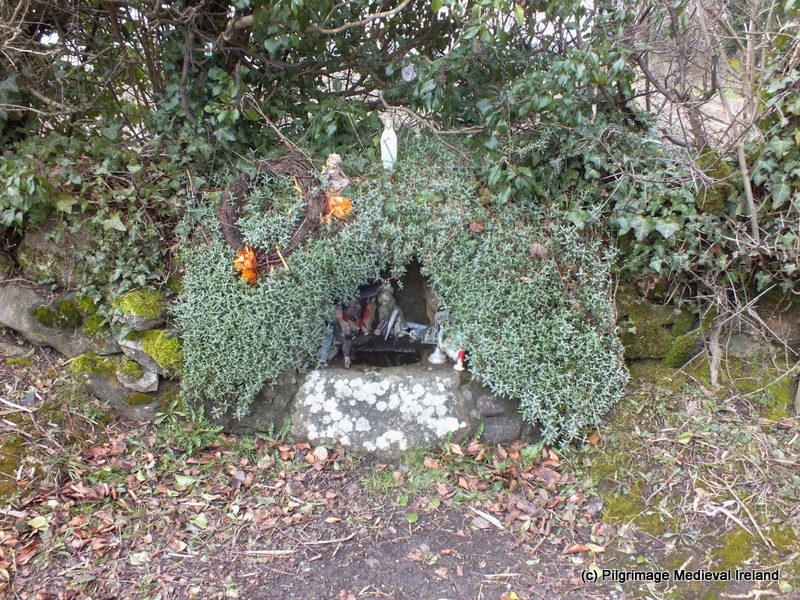 Delighted you enjoyed the post, its such a wonderful area, I am hoping to write something of St Patrick’s holy well there too.